Clearly a desirable type looking at the prices for both NOS and used on the market today (like Ebay). A so called matched pair of particular brands easily does 500 Euros (july 2013). Are these prices justified? As a collectors item certainly, but for use? I mean, if you buy it and put it in a socket, deterioration immediately starts.. Are there other alternatives? 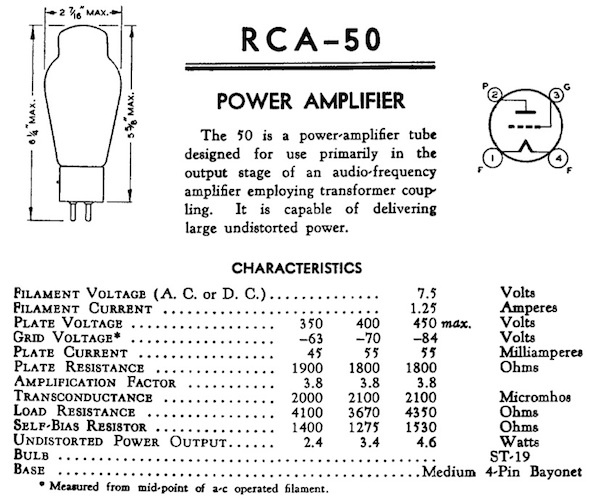 Type 50 once was the "powertower" of triodes in the 1920's upto -30's: A whopping 4.5 watts of output power could be achieved, be it at high voltage and with some less handy features such as a maximum grid resistor value of only 10K.. At first they were built in mighty globe glass bulbs and later on in shoulder types, both big and smaller. Especially the globe types are wanted now-a-days, and if you can source a mesh-plate, heaven should be near..
Globe version begin 1930, followed by big ST and later on by smaller ST.
Filament is 7.5V at 1.25A, high-voltage 450V at a bias of -84V with 55mA current at a dissipation of almost 25 Watts delivers 4.6 Watts output power. Compare these to the more modern and efficient 300B: 5V at 1.25A, 350V at -75V with 60mA, dissipating 20W for 7 Watts output power (and with no restriction of 10K on the grid). So why do people pay a lot of money for these less efficient valves? Well, not being able to answer that question, I can give you my opinion: I do prefer them over 300B's in the same amplifier.. 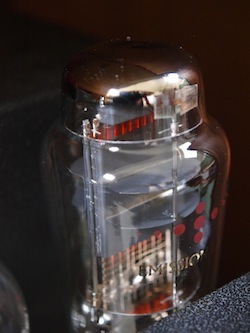 Type 50 is, imho, superior regarding tone at especially the mid/low regions, there some magic happens.. 300B is a fine valve, type 50 is a more refined valve.. The mighty type 50 is being produced again, just like the 300B and many other valve-types. It is being produced by Shuguang for a couple of years (if I remember correctly since 2010) and recently Emission Labs issued the type 50. Where Shuguang issued a globe version, Emission Labs issued a shoulder type version (maybe more to follow?). FullMusic also has or had a reissue, with their so called "meshplate" and even a graphite plate (why graphite? ), but I do not have a pair available for this shootout. 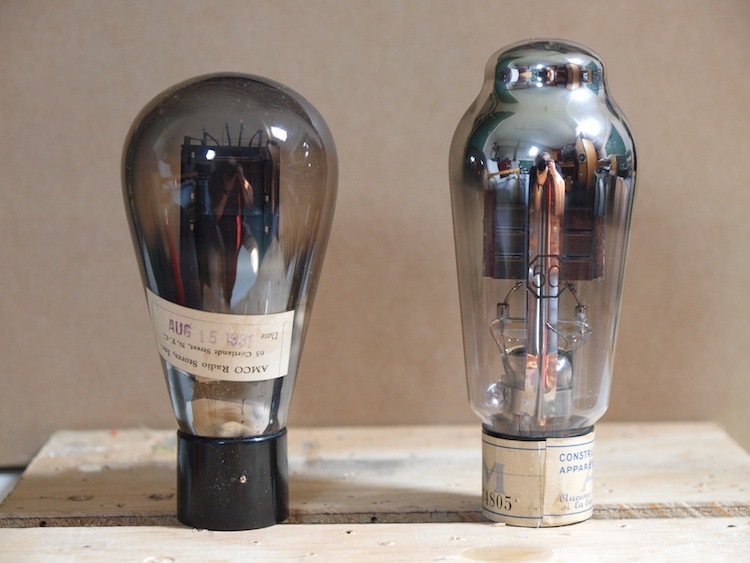 The globe glass bulb is even taller than the original type 50. 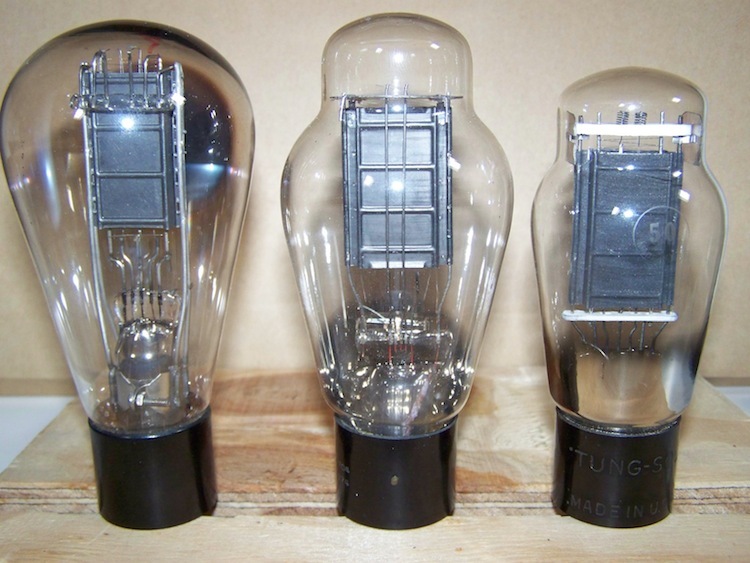 Throughout production, several bulbs with different thicknesses in glass were observed, as a matter of fact, the pair being auditioned had significant difference in weight due to different glass thickness. The inner structure is a bit vulnerable, meaning that if the glass bulb is tapped the inner structure will bend on the lower part. An inner structure that is somewhat askew certainly looks not cool, but can be tapped upright again. Electrically this reissue sets like the original. Just like all other EML valve designs, the 50 is built like a tank and in contradiction is aesthetically near perfect. A very robust build using thick glass and ceramic socket. Where the originals and Shuguang have a "M"-form filament, the EML has tripled this length in "MMM", resulting in more evenly spread emission because of increased heater surface. A gold-grid is used and the plate-structure is also a bit larger compared to the others resulting in a higher admissible plate-dissipation, although normal operation is recommended. Also the 10K limitation on the grid does not apply, up to 250K can be used here. This valve also electrically sets itself like the original. This is an integrated design with a 5842 driving the 50 using a 1:1 interstage transformer. The 50 has 380 Volts on its plate and is biased with -67 Volts through the secondary of the interstage resulting in a current flow of 47mA, dissipating about 18 Watts, good for about 3 Watts output power. Filaments are fed using TentLabs heater modules. Types 50 auditioned (left to right on picture). 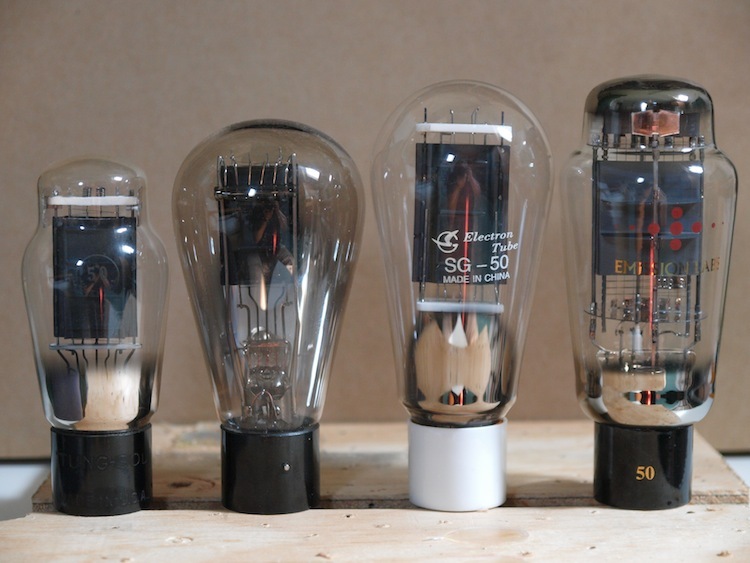 All tubes settled about the same in the amplifier, so no significant difference in plate voltage and -current. The objective was not to point out the better 50 since this will be a subjective opinion but to characterize the sonic characteristics of each type 50. These are complemented with some considerations in relation to possible purchase.. The listening panel consisted of 3 audio enthusiasts with nothing else meaningful to do on a sunny afternoon. Findings were not discussed during the audition but noted down. Music tracks were Cannonball Adderly - One for daddy-o, Modern Jazz Quartet - Django and Herman van Veen - Fiets, all played on vinyl..
Below you can read the aggregated notes during listening. Shuguang is a bargain at appr. 130 Euros the pair, maybe a must-have when playing a 50 amplifier when not seriously listening. Lifetime may be an issue since I do not know by experience what to expect. Seems that if 1500hrs can be reached, it still will be attractive to purchase since the price of one pair old stock globes allows your for about 4 pairs Shuguang..
Paying over 500 Euros for a good testing pair of original globes type 50 is worth some consideration: The new production EML, priced at 520 Euros the pair, is being delivered with guarantee and is sonically at least identical to original globes 50. Expected lifetime may be over 8000 hrs looking at the lifetime of other EML valves. I hope this short audition may help you along on your road to type 50..
Actually warranty on EML valves has been extended up to 18 months since the first of july 2013 when online registration has been done. This includes 5 years warranty on vacuum. (See here for more information.